Planned Parenthood just found out how in 50 words or less they can communicate to the world their twisted interest in indoctrinating the next generation with extreme abortion-centric viewpoints. 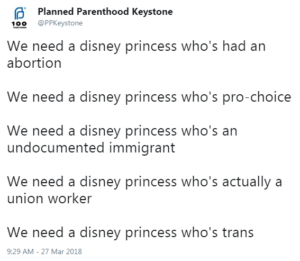 The now-viral tweet from a Planned Parenthood affiliate in Pennsylvania suggested we need a Disney princess who’s had an abortion. What’s telling is their response – after it went viral despite their effort to delete the tweet, they were compelled to confirm the posting, but made no apology. In other words, we agree with what’s said, but just not for a Twitter post. Planned Parenthood’s extremism should scare every parent. They are actively seeking to target children in any way possible in order to influence their beliefs about abortion. By just one vote, the school district voted down the proposal. This has kept Planned Parenthood Keystone out of this particular school district this year, a school where they have an abortion clinic less than two miles away that averages 900 abortions each year and charges between $450 and $540 for each procedure. This viral tweet is indicative of Planned Parenthood’s ideology. 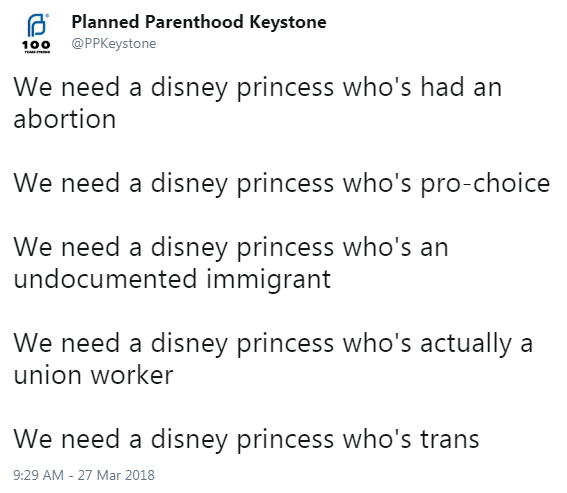 They absolutely think a Disney princess story should focus on abortion. They just now will try to keep it off of social media and contain it in conversations in your kids’ classroom. Carnegie Library in Pittsburgh Planned a story hour for 5-6 yr olds with a Drag Queen in the interest of diversity. Not age appropriate at all.